It’s pretty much expected that any game with a multiplayer mode that comes out these days will feature some sort of microtransactions. Maybe not every game, but it’s most certainly a common practice that has gained much controversy in recent years. We’re happy to report that the upcoming Earth Defense Force: Iron Rain will not include microtransactions of any kind, according to Series Producer, Nobuyuki Okajima. We do [have] some of the weapons and custom parts, and additional DLC release, but we won’t [have you] using real money [and] changing it to in-game currency. Like an in-app purchase—we won’t do that. Okajima was also hinting that post-release content could be coming for Iron Rain, but did not give many details, as the developer is still “considering” it. Whatever content is released, we at least know we won’t have to spend our hard earned dollars on microtransactions. The 4v4 competitive multiplayer mode, Mercenaries, would be ripe for getting you to buy in-game items with real money, so it’s refreshing to learn that everything can be earned for free. Mercenaries has you battling against another team to destroy bugs and collect gems dropped by them to earn points. Yuke’s and D3 Publisher could have monetized the random pickups or items you acquire, giving you an advantage against other players, but luckily, that is not the case with Iron Rain. Does this news surprise you? 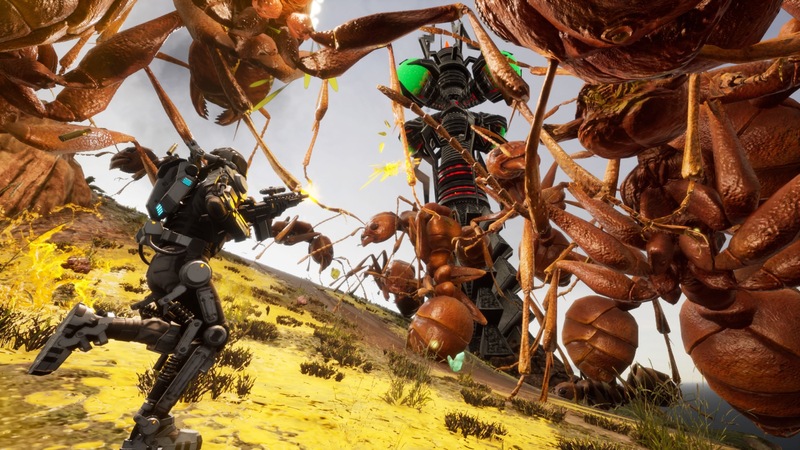 Will you be giving Earth Defense Force: Iron Rain a try when it releases on April 11, 2019? Let us know!